Summary: Audrey can’t leave the house. she can’t even take off her dark glasses inside the house. Audrey doesn’t leave the house. She’s plagued with anxiety, so much so that her only option is to wear sunglasses around everyone to avoid eye contact, which isn’t exactly ideal when you’re falling for your brothers best friend and you just want to leave the house and get better. But when a note slides through her letter box, exclaiming that she was being given a kiss, it starts the long road to recovery for Audrey. 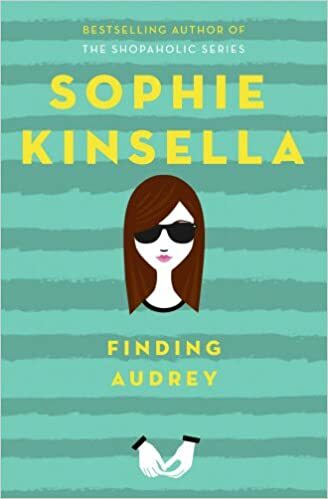 Sophie Kinsella is the Queen of chick-lit, funny and relatable novels. I know I’m not the only person that thinks this to be true as well. I’ve read a few of her other novels which I absolutely adored, so when I finally got hold of Finding Audrey, I could not have been more excited to start (in fact, the book only sat on my shelf for a few days, I feel like that’s an achievement for me). I absolutely loved Finding Audrey. I felt like the idea of anxiety was dealt with quite well. A lot of the feelings that Audrey was describing felt relatable, if not to me, to many other people. It was cleverly written so that it was delicately dealt with. That being said, Linus (Audrey’s love interest) did not please me as a character at all. I fell in love with Audrey’s family. Her eccentric mum and dad and brothers, Frank and Felix. However I had one problem with Linus. He pushed Audrey to recover too much. Often he was portrayed as gently pushing her to make decisions she wouldn’t used to, helping her on her road to recovery. However I felt often enough that he was just pushy. It made the novel slightly less realistic for me and quite frankly, he frustrated me. One of the main problems I had with this novel was the set up/pay off. We know there is a reason why Audrey has anxiety and will not leave her house. However we as an audience are never told. Every character introduced to us in the novel is aware what happened in Audrey’s past, except for the reader. I just found it a little frustrating towards the end why that information could not be divulged. That being said, I absolutely adored the way this story was set out. I’m a sucker for experimental writing. Everything Everything by Nicola Yoon and Me and Earl and The Dying Girl by Jesse Andrews are two of my favourite novels because of the unusual input in to the writing. Scattered throughout Finding Audrey you can find snippets of her life told in script. It was something I didn’t expect, and ultimately enjoyed more than anything else about the novel. Overall I did really enjoy this, it’s definitely worth a read (and probably a reread) but there were just a few parts that snagged at my frustration string. Try reading Finding Audrey for yourself and let me know your opinions, especially what you think of Linus! Click the image below to get you copy of Finding Audrey!